This project was Recorded at Double-a-productions Studio in Elysburg, PA (Owner, Al Paul). 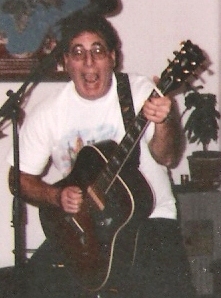 All songs and lyrics were written by Jim “Desi” Desiderati. The interpretation of these songs by each musician has evolved into one of the best musical journeys of my life. I am very grateful to have had such wonderful talent helping me with the recording my first CD. Razor Rat – Jim Desiderati, Lead/Backing vocals, Electric Lead/Rhythm guitar. Al Paul, Electric Bass, Electric Lead guitar. Sean Madden, Percussion. Ravi Evans, Saxophone. Frank Bressi, Backing vocals. Patience – Jim Desiderati, Lead/Backing vocals, Electric Lead/Acoustic Rhythm guitars. Al Paul Electric, Bass, Percussion compliments of Double-a-productions studio track. Ravi Evans, Saxophone. Frank Bressi, Backing vocals. Mr. Disguise – Jim Desiderati, Lead vocals, Electric Lead/Rhythm guitars, Motif 7 Keyboard., Al Paul, Electric Bass. Sean Madden, Percussion. Nuthin’ Ventured – Frank Bressi, Lead vocals. Jim Desiderati, Electric Lead/Rhythm guitars. Al Paul, Electric Bass. Sean Madden, Percussion. Hurts Sometimes – Frank Bressi, Lead vocals.Jim Desiderati, Electric Lead/Acoustic Rhythm guitars. Al Paul, Electric Bass, Acoustic Lead guitar. Sean Madden, Percussion. Ravi Evans, Saxophone. South Mountain Dreams – Jim Desiderati, Lead/Backing vocals, Acoustic Rhythm guitar. Al Paul, Electric Bass, Acoustic Lead guitar, Percussion compliments of Double-a-productions studio. Ravi Evans, Saxophone. Frank Bressi, Backing vocals. Traces Exist – Jim Desiderati, Lead/Backing vocals, Acoustic Rhythm guitar. Al Paul, Electric Bass, Acoustic Lead guitar, Percussion compliments of Double-a-productions studio. It’s OK To Believe – Frank Bressi, Lead/Backing vocals. Jim Desiderati, Motif 7 Keyboard, Acoustic Rhythm guitar. Al Paul, Electric Bass/Lead guitar, Percussion compliments of Double-a-productions studio. You gave me hope when all seemed hopeless, you gave me laughter when all seemed lost. You gave me shelter when nights grew cold, and you gave me light in the darkest hours. I will never forget this…. 40 years of dreams pouring into 4 studio sessions coordinated with text messages and pulled from old and new relationships over a 20-year period. The 1st session started with a right hand finger injury causing my middle finger to eventually swell to twice its size ending the night abruptly. Despite freezing temperatures, icy stairs, snow covered roads and limited time, this CD became a reality. Key To Your Soul represents a glimpse at a lifetime. Follow my story from awkward self-consciousness through streetwise experimentation and into soul fulfilling work with Hospice as an RN. It is using music as an opportunity to finally express my emotions as sound. Forever taking second stage to the responsibility of work and school, music existed inside of me as a boiling broth of hope, passion, and ideas. I have been writing poems and songs for over 40 years. And This is the story Key To Your Soul will tell. Key to your Soul – written on 2-18-1996 the title track sees me as a child in hiding from the reality of what deception can do to our lives and eventually realizing that we all hold the key to our own freedom inside us. Inspired by a young patient I met who was experiencing similar family transitions as I had at the same age. Razor Rat – 1-10-2001 tells the story of how a growing interest in guitar took possession of eager fingers with a quickly mumbled slice of advice from a sleep deprived friend I had hunted down after being spellbound by his playing the night before. “Learn where all your A’s are at” He said as he covered his head with his pillow and apologized in fading tones. I hope someday to be able to give him a copy of this CD! Yupward Bound – 9-15-1990 written while working full time in a steel mill pouring molten metal from an overhead crane going on 16 years and now also an adult student in college with a plan of becoming a nurse if the overtime and school schedule didn’t kill me first. Patience – 1-1993 captures the hopeless imagination of unattainable love we so often hear about and many of us may have experienced in our lifetime. Mr Disguise – 8-1982 written at a critical turning point for my life and it is the chilling manifestation of the tortured remains that are left in the wake of a vengeful broken heart. 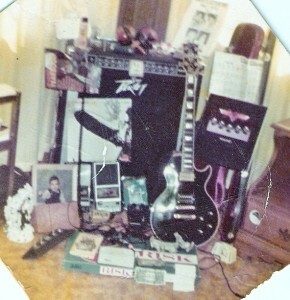 Nuthin’ Ventured – 3-7-1997 started from a dream I awoke from with the initial guitar riffs finding my fingers playing easily as old friends without hesitation one afternoon when I woke with my guitar by my side. The song begins to find the balance between the extremes of love and hate. Hurts Sometimes – 3-7-1997 written in acceptance of change and the beginning of the healing process after having faced the truth inside. South Mountain Dreams – 6-23-1985 was written while sitting on the side of St mountain in Phoenix AZ one evening after moving there to rebuild my life. this song once more brings hope to the surface as the healing continues and a recognition of empathy begins to strengthen a weakened spirit. Traces Exist – 11-22-1984 initially just called Traces, the name was changed when put on this CD. It is a song written about the tragic loss of freedom abusive relationships can cause, and represents the hope that revives love as our strength in life and accepts the struggle to achieve peace as worthy of the pain we endure for it. Inspired by forbidden fruit in the timeless attraction that passion creates and memory clings.